Check the beans for stones or any debris that might have made it into the bag. 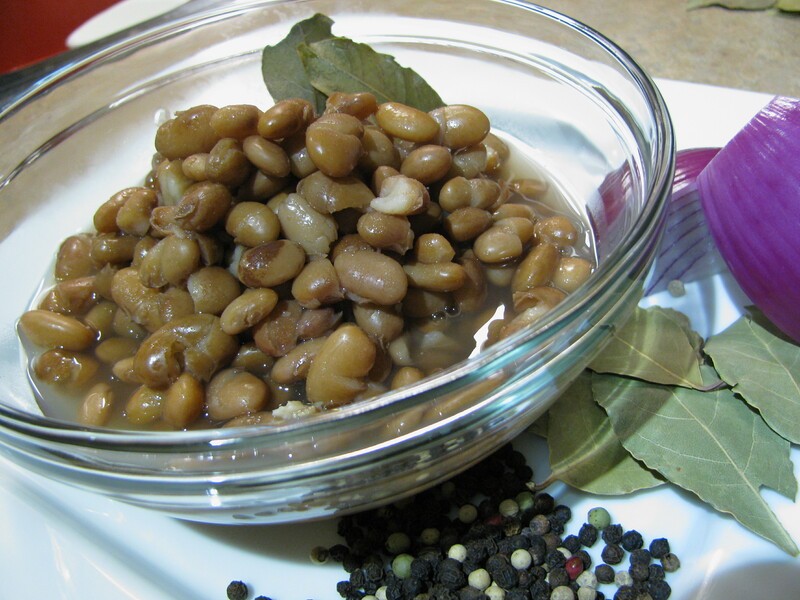 Dump the beans in a large pot and cover with about 6 – 8 cups of water. Let the beans soak over night. Drain the water. Cut the onion in quarters and remove the peel. Smash the garlic cloves and remove the skins. Cover the beans with 6 – 8 cups of water. Bring the water to a boil. Remove from heat, cover and let the beans soak for 1 hour. Drain the soaking liquid. Add the drained beans along with the water, onion garlic and bay leaves to a large pot. Cook for 1 ½ – 2 hours or until the beans are tender. Add salt to taste. NOTE: Do not salt the beans until after they’re cooked. Salting them before they’re cooked with make them tough and gritty. Yuck! Serve them hot with a bit of the bean juice. They’re good as is! Use them in any recipe calling for pinto beans. Check out the refried bean recipe her also. Add 1 finely diced carrot about halfway through the cooking process. Celery works well also. Don’t like pinto beans? Black beans cook up exactly the same way. I’m crazy too,Aly,I know what you mean with juice….very nice…I put some cooked potatos with it even bettter.Nice pict too!!! Oooo! I never thought of adding potatoes to the bean juice. I’m going to try that later today. And thanks so much on the compliment…that means alot coming from such a fabulous photographer! They sure do!! I love adding chipotle and some of the adobo sauce to the beans. What sort of chilies do you add?